Every month we spend an evening scouring the pages of the latest issue of Previews and pick the ten titles we are looking forward to the most. This month it's the May issue which includes comics scheduled to ship in July 2014. Andy H: Ben Templesmith has a unique style. Honestly, you can spot his work a mile off. I think I first 'discovered' him when he and Warren Ellis unleashed Fell on the comic buying public (please do more!). You may have seen his work more recently in Ten Grand with J Michael Straczynski but he's more than just an artist. He's written and drawn his own books too. Check out the excellent Wormwood, Gentleman Corpse to see how he really rocks the comic world. 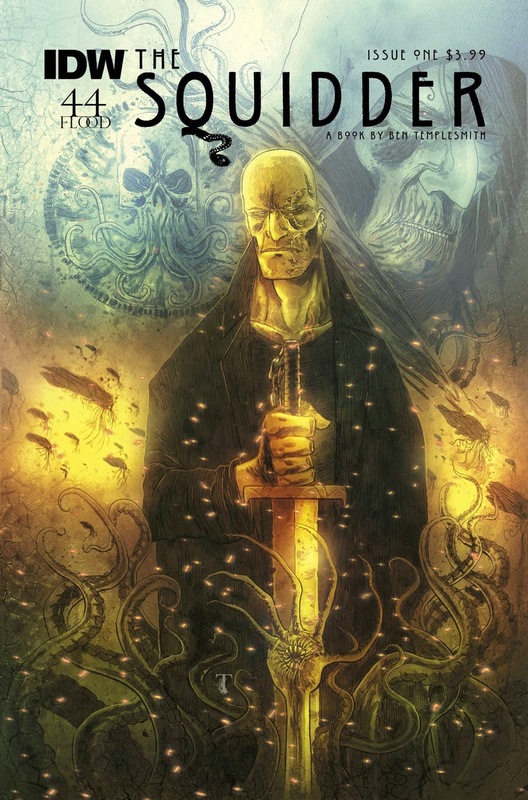 The Squidder is a return to what he does best, Lovecraftian, tentacled mayhem! Originally started as a Kickstarter project, IDW are releasing the OGN as a four issue miniseries. Set in a post-apocalyptic world, now ruled by tentacled overlords, can an old soldier and a renegade Squid priestess overthrow the squiddy alien invaders? I hope so, and I expect a lot of weird and wonderful stuff from the mind of Templesmith to keep us entertained throughout the series. Matt C: High concept pitches just hit you dead on target sometimes. A disgraced medical examiner gets contacted by his ex-con brother who says he can cure all disease. The catch? That cure can only be found in the DNA of superheroes. It’s the kind of crazy idea that pops up every once in a while and sticks out as being something fresh in the genre. Barbiere has steadily been making a name for himself this past year with the likes of Five Ghosts and White Suits and this seems like his most instantly appealing concept yet. My one question is whether there’s a lot more potential than this four-part mini will allow. 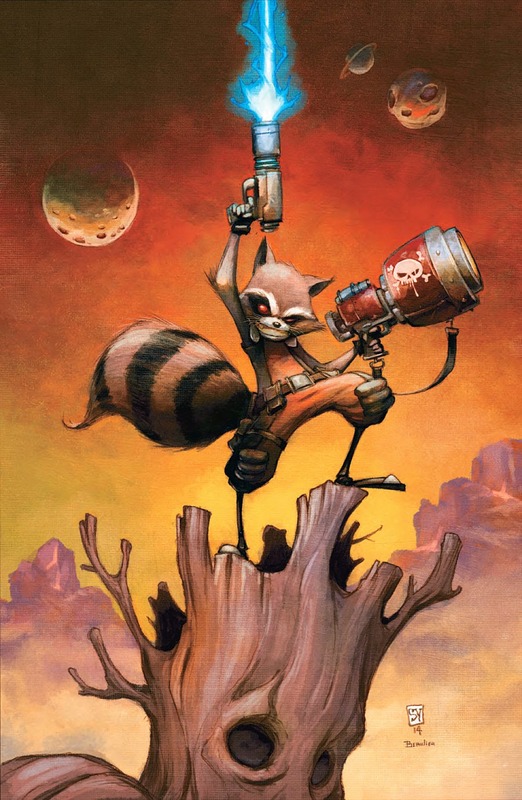 Kenny J: With the marketing machine ramping up for the next instalment in Marvel’s cinematic universe we are getting a slew of new Guardians of the Galaxy related comics including, much to my excitement, a Skottie Young penned and pencilled Rocket Raccoon ongoing. This not only marks the first series that Young will be both writing and drawing but also his first run on Marvel interiors since New X-Men, having since concentrated on his New York Times best-selling Oz series and Marvel Now! variant covers. With his cartoony style there may be no better fit than Young to draw the anthropomorphised space pirate. He has already stated that he will be bringing a Tex Avery Looney Tunes feel to the book: all over-sized guns, over-the-top violence, and razor-sharp edges! James R: Despite the recent upsurge of Image comics as the home for interesting and edgy books, good ol' Vertigo can still come up with the goods. Bodies is a series that is virtually cracking with promise. From the mind of Si Spencer, it’s set across four different time periods in London and deals with four different murders. The series will crisscross and intersect in what looks to be ingenious way, with four different artists giving each era a distinctly different feel. As a fan of From Hell and the novels of Iain Sinclair, this looks right up my street, and for those of you who like an ambitious and smart comic to add to your pull-list, this is definitely one to try out. Kenny J: If you’re a fan of the apparent period realism of Northlanders and the History Channel’s eponymous Vikings this one may not be for you. 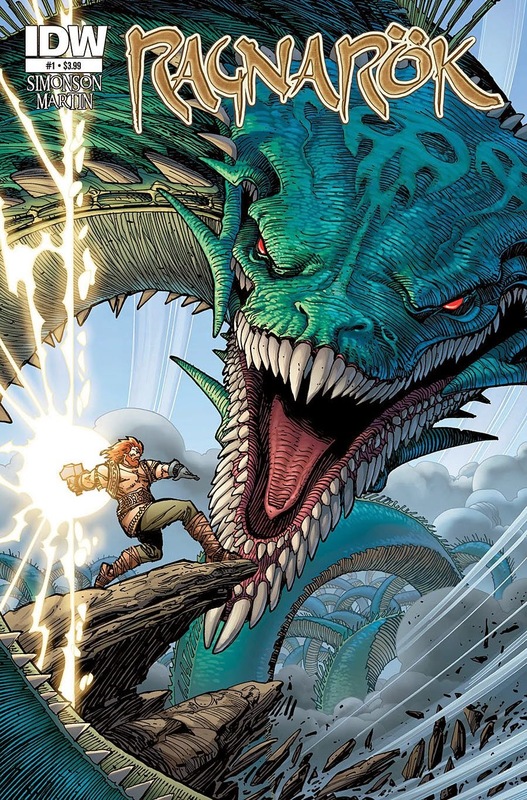 However, if you like epic tales of Norse gods punching giant world serpents in the face then you'd be hard pushed to find anyone in comicsdom more adept or experienced than Walt Simonson. His legendary run on Marvel's own take on the God of Thunder, Thor, lasted over forty issues and introduced many of the characters and concepts that still fill the pages of that comic today. Now he returns to the fertile ground of Asgard, Midgard and all the realms in between to weave a story of love, loss and revenge. Simonson has had a lifelong interest in the Norsemen and their mythologies so there should be enough idea-filled stories to take us from now to the end of time. Matt C: So I spotted this in Previews and was excited enough by the art and the prospect of more new Warren Ellis material that I didn’t really twig that this wasn’t a wholly original concept (it didn't help that the listing dropped the colon). Turns out this is Ellis rejuvenating Rob Liefeld’s character Supreme for the modern audience, and I have to admit that knocked my enthusiasm down a couple of notches. Having minimal knowledge of the character and the world he inhabits (beyond him being a Superman analogue) I’m almost tempted to skip it if it weren’t for the fact that, yes, it’s Ellis, and Ellis has a habit of injecting new life into old concepts. Also, Alan Moore took a crack at the character during the ‘90s, and from what I hear it was a pretty good crack at that. Definitely worth looking at the first issue at the very least. James R: This one is a no-brainer. Rick Remender is certainly the man of the moment with both his work at Marvel and his creator-owned books at Image winning plaudits from all corners (and a fair few from us! ), so his new Image book is a definite addition for this month. Low is based in a future where the sun has begun to expand and consume the solar system - man has been driven into sub-aqua cities, whilst probes scan the cosmos for a new potential home for humanity. The story begins with one of the probes crash-landing on Earth and we follow the chase to secure it. 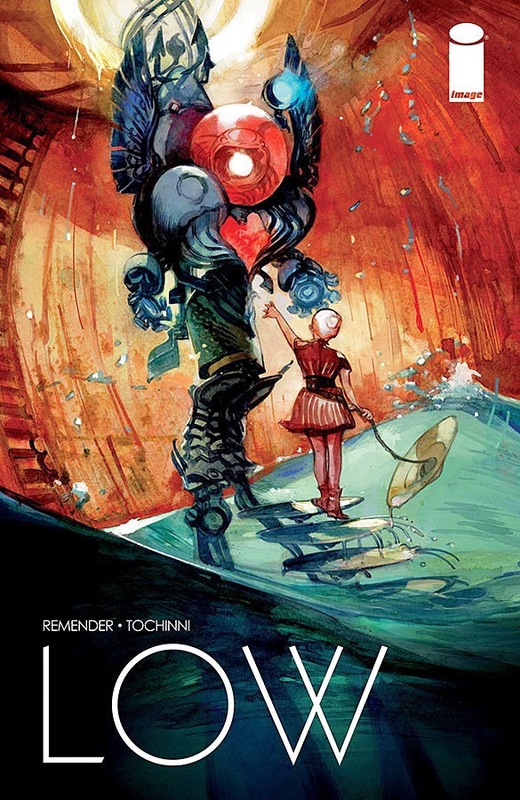 I'm an absolute sucker for a) science fiction and b) a dystopia at the best of times, so the prospect of a series dealing with these themes, written by Remender and illustrated by Greg Tocchini (Remender’s artist collaborator on Last Days Of American Crime) means that Low should be a must-read. Kenny J: After exploring the strange talent and legend of Luther Strode, and bone crunching crime drama in Dead Body Road, Justin Jordan is ready to grow his creator-owned work at Image with Spread. Jordan has impressed with character driven plotting that isn't scared of the fleshier elements of the art form. Spread seems like no exception. As humanity tries to survive after being bought to the edge of extinction by a John Carpenter style infection that turns everything into more of itself, a man simply known as No finds a baby that may hold the key to salvation. Assisted by Kyle Strahm with bold art and the vibrant colours of Felipe Sobreiro, this makes for one bright and beautiful horror. 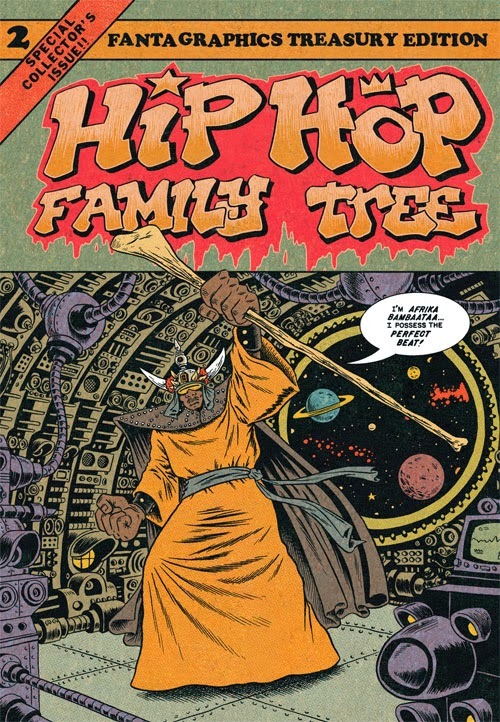 Matt C: The Free Comic Book edition of Hip Hop Family Tree was such a passionate and infectious treat that, a few beers after reading it, I found myself making a bit of an impulse purchase on Amazon, and not long after that, Book 1 arrived in the post. I’ve yet to dive into it, but the Marvel Treasury-sized tome is very enticing indeed, giving off an air of Bronze Age retroism to reflect the era it covers. I expect to have made the plunge by the time this sophomore volume hits the stands so I’m adding it to my shopping list now. To my eyes, Fantagraphics generally seem to offer more niche product in the marketplace, which I of course applaud, because every once in a while I’ll be part of niche audience that will lap up something they put out. James R: Alan Moore may be an increasingly decisive figure amongst comics fans, but for me he remains the standard by which all other comics writers are judged, and when partnered with the brilliant Kevin O'Neill on League Of Extraordinary Gentlemen, he's an irresistible talent. This collected edition brings together his Century arc, which demonstrated that Moore has still got magic in his fingertips, taking Allan Quartermain, Mina Murray and Orlando from 1910 to 2009, covering the whole 20th century through the prism of a vast swathe of fictional characters. The plot is as inventive as you'd expect from Moore, and illustrated as lavishly as you'd expect from Kev O'Neill. If you didn't pick up these issues individually, then the collected is certainly a wise investment.